As a career and executive coach, I’ve heard from thousands of professionals over the past 13 years about their biggest career regrets, and how these regrets have negatively (and heartbreakingly) impacted their lives. I know too from personal experience how crushing it feels to make serious mistakes and detours in our professional lives, and how challenging it can be to recover from these mistakes so that we can move forward in a positive, hopeful way. While I have developed my own hypotheses about the key differences between the way in which men and women perceive the regrets of their careers, it’s eye-opening to review new statistical data on this issue. Recently I had the opportunity to do just that. 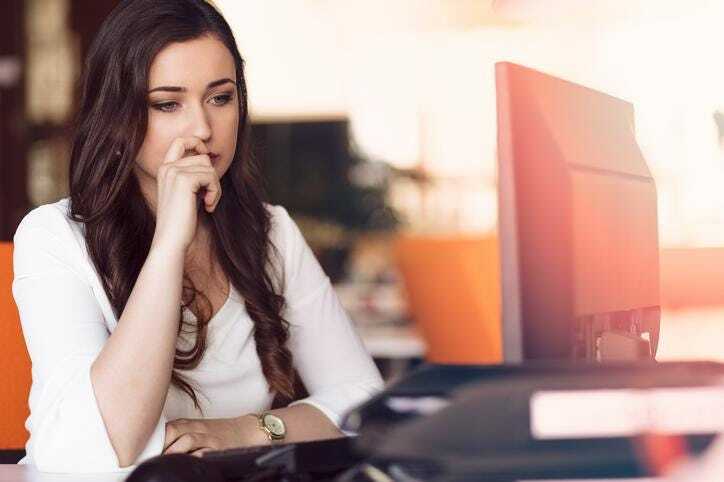 I was intrigued when Zety – an online resume builder and career site – reached out to share the results of their latest research on Americans’ biggest career regrets. 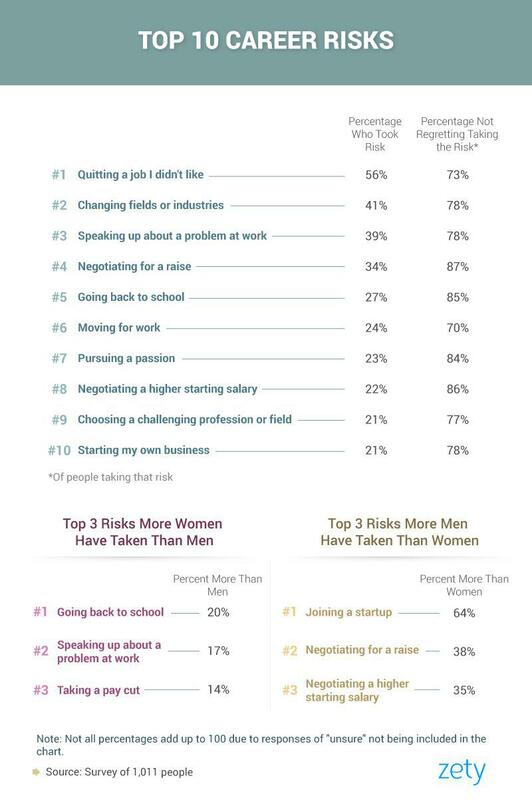 As I expected, there are indeed statistically significant differences between men’s and women’s career regrets and the types of risks they take. Here are the complete results of their study. In looking at career regrets of men versus women, we see that there are significant differences. While there are some similarities between men and women, the chart below indicates which regrets are significantly different between men and women. We see that women more often than men regret: 1) not speaking up about a problem at work, 2) not negotiating a higher starting salary, and 3) working in a field where they don’t make enough money. Significantly more men than women regret: 1) not working harder, 2) not maintaining their network, and 3) not taking more initiative. Clearly, women have greater regrets around not advocating for themselves or speaking up, as well as not earning sufficient money, whereas men experience more regret around not pushing themselves further and achieving a network that would support their growth. When it comes to risks not taken, there are significant differences between men and women as well. 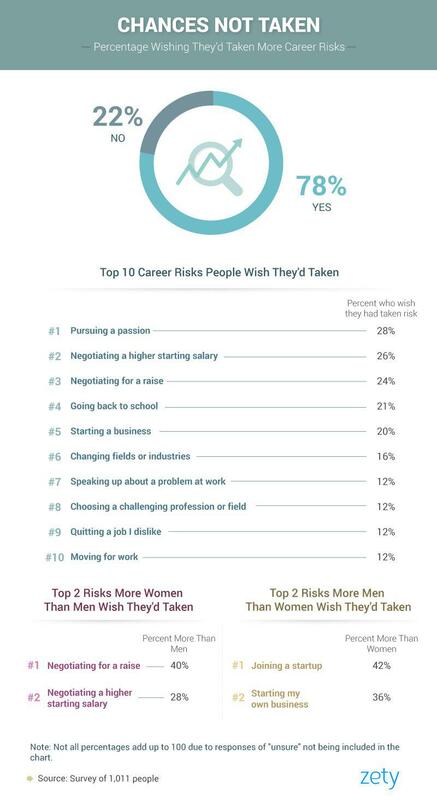 Overall, 78% wished they’d taken more career risks. More than women, men regret not joining a startup and starting their own businesses. And significantly more women wish they negotiated for a raise and for a higher salary. This data directly echoes what I’m seeing in my career and executive coaching practice focused on the advancement of women in business. I’ve seen that many women show a deeper reluctance than men to negotiate powerfully for themselves, ask for more money and responsibility, go out on their own, pursue highly lucrative fields and join more risk-intensive ventures such as start-ups. What do these differences signify? While we aren’t given the “why’s” behind these responses, I’ve found in listening to thousands of professional women and men’s stories – about how they were raised and trained to think and speak about themselves, and operate in their careers – that the root causes of the differences in these behaviors start in early childhood and are reinforced early on in teen years all the way through adulthood. I’ve seen that in business today, even though many organizations state they working to develop a deeper and stronger focus on gender equality and diversity in our work cultures and supporting the advancement of women, the progress has stalled. Why is that? Because there remain powerful internal and external influences that prevent women from feeling strong, safe and comfortable to speak up powerfully, take significant career risks, compete authoritatively and advocate confidently for themselves, and to claim and achieve what they want and deserve. Until we can address these influential factors at all the key levels – including the individual, organizational, institutional and societal levels – it will remain very difficult to impossible to reach gender parity and equality in our workplaces. 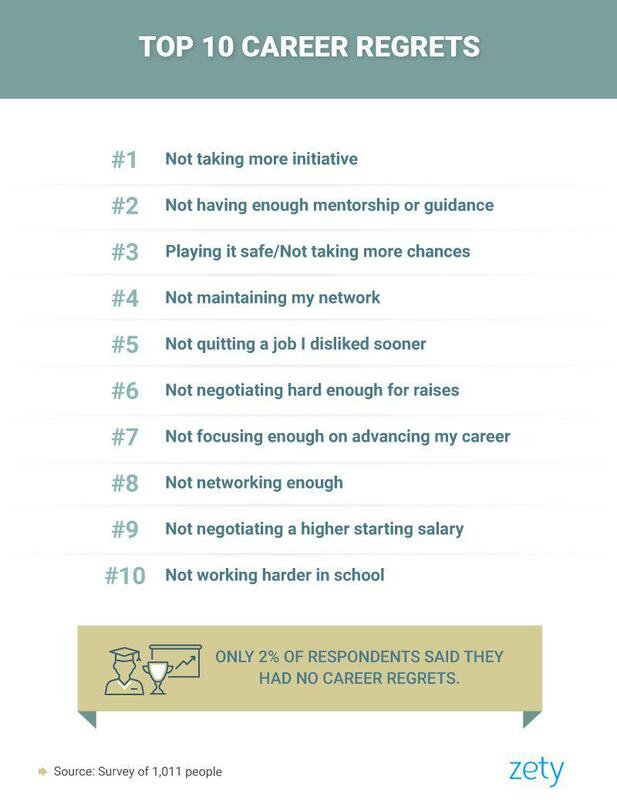 Further, this data shines a bright light on the importance for each of us to examine our career regrets as a way to understand the decisions and actions we’ve taken that haven’t helped us reach our highest and most rewarding potential. To address your own career regrets, take time this week to think deeply about what you regret in your life and career. Dimensionalize it and understand as thoroughly as possible where you are today and where you want to be, and what specific actions, experiences and decisions have supported or thwarted your growth and happiness. Once you understand what you feel was a career misstep, arrive at one key action you can take this month that will address it. In other words, start closing all of the power gaps you experience that have contributed to this regret or misstep. As the study shows, most of us believe it’s never too late to change course. Take empowered action now so that you will not have to carry the difficult burden of regret for the rest of your years.